Sometimes a road is not simply a road. It’s not just a means of getting from A to B. A journey can be an experience you don’t forget, more significant than your destination. You’ll find one of these special roads in the South West of England. An unfenced ribbon undulating across the wilds of Dartmoor. The B3212. It’s soulless name doesn’t give an inkling to the wonderful landscape unfolding as you crest each towering hill and swoop down again into deep valleys split by crystal streams edged by treacherous bogs. From Moretonhampstead, the gateway to the eastern side of Dartmoor National Park, the road wends its way directly across the middle of the moorland, a fearless feat of engineering which arrives on the western edge of the moors at Yelverton, a satellite of Plymouth. You can drive for miles without seeing a soul. A vision of purple heather and golden gorse in late summer, it’s home to hardy sheep, cattle and ponies which wander across the road on a whim, disdainful of traffic, sometimes even lying prone on the tarmac, enjoying its warmth. You’re not king of this road – you give way to Dartmoor’s inhabitants, which fix you with a lazily condescending gaze. Shaggy highland cattle, Dartmoor ponies descended from the hardy sort which once transported farmers and postmen, sheep with fluffy lambs in tow whose eyes reflect green in headlights on a misty eve. It’s no good trying to drive this road in a hurry. But despite the beauty, you may not want to linger in a few places along the B3212. Its uniqueness comes too from legends and mysteries that have bestowed on it the reputation of being one of Britain’s most haunted roads. Just a few miles from Moretonhampstead you cross a lonely junction known as Watching Place. Explanations for the name are rife, but each comes with hard evidence and the ring of truth. Is it down to the gallows that stood at the crossroads, where relatives watched over miscreants until permitted to cut them down? Because neighbours left food each day at the entrance to a nearby plague-ridden farm until noone collected it and they burnt the place down? Where bounty hunters waited in the hope of catching prisoners of the Napoleonic Wars, who were billeted nearby, breaching their parole? Or because highwaymen watched and waited here to pounce on wealthy victims? Whatever the origin, Watching Place has a spine-tingling history and an eerie atmosphere which horses and herded animals are still reluctant to pass. Drive on a few miles, past the remote Warren House Inn where the fire in the hearth has burnt since it was built in 1845, and hold your steering wheel tight as you approach the bridge famously haunted by the hairy hands. Cars and even ponies and traps have crashed here with mysterious frequency since the early 1900s, attributed to mysterious hands wrenching them off the road. Children riding in a sidecar reported in 1921 how they leapt clear as their father fatally wrestled with his motorbike against an invisible force. A woman staying nearby described how she woke to a hairy hand creeping up her caravan window ‘with evil intent’. Cross with care! This road changes from season to season, gentle and warm in the summer sun with ice cream vans in the most incongruously remote places, fierce and wild in the winter with gales and snow to test your blood pressure, wondrous beneath star-studded unpolluted night skies. 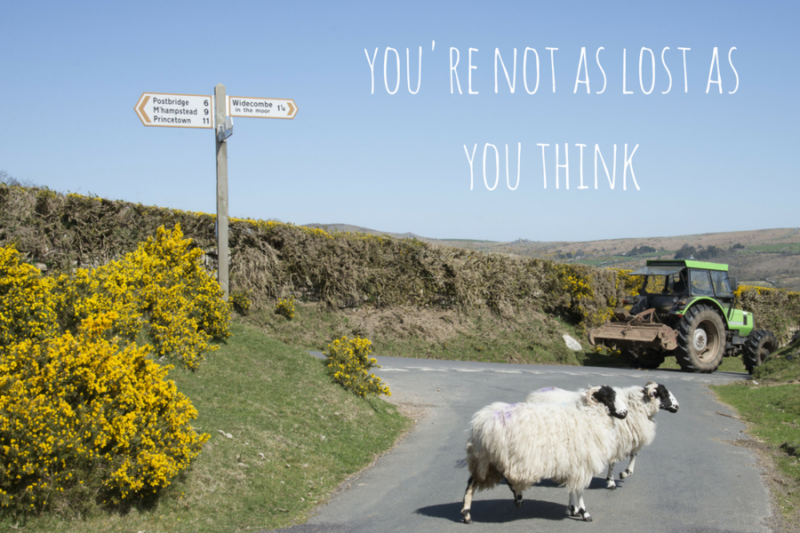 So come to Dartmoor for a very special experience and travel the road – it may not be your most direct route, but there isn’t any doubt it’ll leave you impressed!